Airbnb said on Thursday it acquired London startup Accomable to expand home-renting opportunities for people with disabilities, the latest expansion as Airbnb grows its global travel business. The deal includes adding to the Airbnb website Accomable’s roughly 1,100 house and apartment listings that can accommodate guests with physical disabilities, the companies said. San Francisco-based Airbnb lists more than 4 million houses, apartments, rooms, boats and other accommodations that guests rent directly from the owners, and Airbnb takes a cut of the fee. The companies declined to disclose the price and terms of the deal. 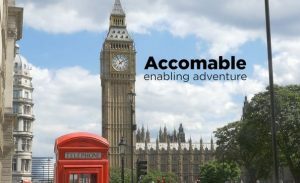 The Accomable website, which is similar to Airbnb but only features properties accessible to people with disabilities, will be shut down in the coming months. Airbnb said it hired Accomable’s founders and most of its seven-person staff to build out Airbnb’s wheelchair-accessible housing inventory and provide more complete and accurate information to travelers with disabilities who often rely on a hotel emailing pictures of a room to determine whether it is accessible. Airbnb said it will add features so homeowners can detail in their listings whether their homes have stairs or an elevator, doorways and bathrooms wide enough to fit a wheelchair and showers with handlebars or a chair. Accomable co-founder Srin Madipalli, 31, started the company two years ago after quitting his job as a corporate lawyer and embarking on a five months of travel around the world. He said he repeatedly found that information about wheelchair accessibility at hotels was inaccurate. Madipalli was born with spinal muscular atrophy, which left him without use of his legs and limited use of his arms. Accomable had lots of interested travelers but not enough cash or staff to build out the inventory, Madipalli said. The site was only able to fulfill about 5 to 10 percent of booking requests. He raised nearly $400,000 from investors. “We see the need every day, which is why we wanted to team up with a bigger player,” Madipalli said. Madipalli said he has never used Airbnb because of the lack of wheelchair-accessible rentals. “But I look forward to trying it out,” he said.